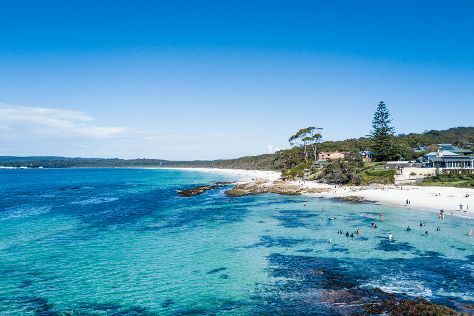 You've now added Hyams Beach to your itinerary. To see photos, maps, and tourist information, refer to the Jervis Bay holiday planning website . Sydney to Jervis Bay is an approximately 4.5-hour train ride. You can also take a bus; or do a combination of train and bus. Plan for little chillier nights when traveling from Sydney in December since evenings lows in Jervis Bay dip to 17°C. Wrap up your sightseeing by early afternoon on the 29th (Sat) to allow time for travel to Batemans Bay. For ratings, traveler tips, and other tourist information, read Batemans Bay trip planner . Drive from Jervis Bay to Batemans Bay in 2 hours. In December, daytime highs in Batemans Bay are 30°C, while nighttime lows are 17°C. Finish up your sightseeing early on the 30th (Sun) so you can travel back home. Moruya is a town in New South Wales, Australia, situated on the Moruya River, on the far south coast situated on the Princes Highway 305km south of Sydney and 175km from Canberra. Start off your visit on the 30th (Sun): get engrossed in the history at Moruya Museum and then head outdoors with Total Eco Adventures. To find traveler tips, where to stay, other places to visit, and tourist information, go to the Moruya trip planning tool . Moruya is just a short distance from Batemans Bay. Wrap up your sightseeing by early afternoon on the 30th (Sun) to allow enough time to travel to Narooma. Narooma is a town in the Australian state of New South Wales on the far south coast. Your day-by-day itinerary now includes Mill Bay Boardwalk. Start off your visit on the 30th (Sun): kick back and relax at Blue Pool. To see traveler tips, reviews, maps, and more tourist information, read Narooma sightseeing planner . Traveling by car from Moruya to Narooma takes an hour. In December, daily temperatures in Narooma can reach 26°C, while at night they dip to 16°C. Wrap up your sightseeing by early afternoon on the 31st (Mon) to allow enough time to travel to Eden. For maps, reviews, other places to visit, and more tourist information, refer to the Eden trip planning app . Traveling by car from Narooma to Eden takes 2 hours. In December in Eden, expect temperatures between 26°C during the day and 16°C at night. You will have some time to spend on the 1st (Tue) before leaving for home.